NC State’s Textile Protection and Comfort Center (TPACC) is a global leader in research on various textile materials, garments and ensemble systems. Located in the Wilson College of Textiles, TPACC provides experiential education to undergraduate and graduate students who represent the next generation of textile innovators. 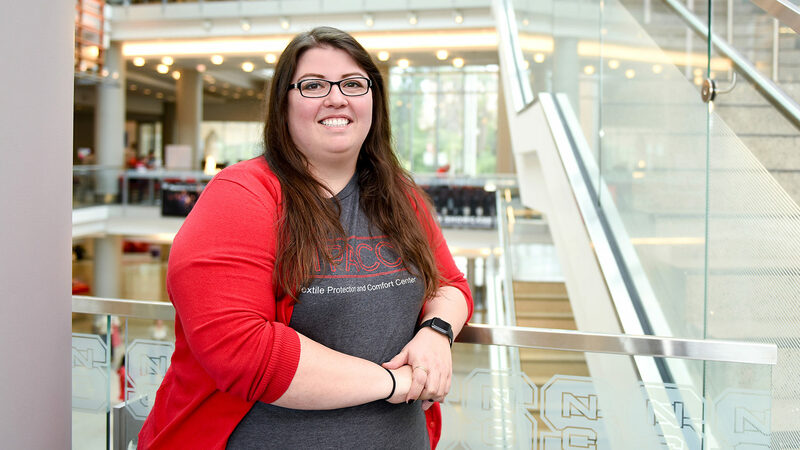 We spoke with Kelli Smith, a TPACC graduate research assistant from Mayodan, North Carolina, about her work with the center, her research interests and how she hopes to weave her experience into her future plans. My sister went here for her undergraduate and master’s degrees in accounting, so she helped me to be very pro-Wolfpack. When I was trying to figure out where to transfer to from Guilford Technical Community College, I applied to NC State because I was interested in chemistry, and the polymer and color chemistry program jumped out to me. I graduated with a bachelor’s degree in polymer and color chemistry in 2017, and am pursuing my master’s degree in textile chemistry. I’m a transfer student, and while I was going to Guilford Tech, I was working at 911 telecommunications in Guilford County as a dispatcher and telecommunicator. At the time I worked with and became friends with a lot of first responders, police officers, firefighters and EMTs, so helping them is important to me. At TPACC, we’re all about protective textiles, especially in terms of evaluating materials for safety, like firefighter turnout gear for example. I’m proud to be able to apply what I have learned here to improve the working conditions of first responders and make their lives safer. What is your role with TPACC? I’m a graduate student researcher. Currently, I’m working on a project to improve the glove used to hold a hoist cable in helicopter rescues. We’re working on improving abrasion resistance of the glove’s fabric without compromising its dexterity. That’s going to help a lot of people so I’m very excited about that. Right now that project, along with getting through my thesis on May 3, is my main focus. The work I’m doing for my thesis is more related to the apparatus that we’re using to qualify the materials for the hoist glove. I’m aiming to make a standard for the cable abrader so that it can be used for other materials in the future, or in qualifying other types of protective textiles. I plan on staying at NC State to pursue my Ph.D. I’m leaning toward continuing with fiber polymer science, and I definitely want to stay with TPACC. How do you hope to make an impact on your field with the education you have received at NC State? My ‘elevator speech’ for the longest time was “I want to get into a lab and make something useful.” I’m already doing that with TPACC, and would eventually like to keep going in research, whether that’s research and development, or design. With my polymer background, there’s a lot of fascinating things you can do with various materials, especially in regards to protective textiles. What is something people may not know about your work/your program? This year is actually TPACC’s 25th anniversary. TPACC is a great research environment, and there are so many wonderful people there, from staff to the research advisors to the student researchers. Also, I participated in the Textile Association of Graduate Students (TAGS) Wilson College of Textiles Image Contest. Last June, my colleagues and I went to a training conducted in Salisbury, with the National Guard, State Highway Patrol and local rescue personnel, from Asheville and Charlotte. 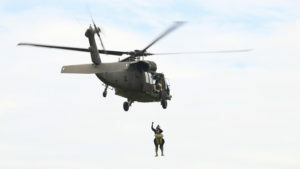 We got to watch them conduct helicopter rescue training exercises. It was as up close and personal as you could get without being on the aircraft. The picture that I submitted was taken during one of the practice rescues, and you can see the hoist operator leaning out of the helicopter holding the cable with the glove that we’re working on. There were a lot of great images submitted to the contest. I placed third and was really excited about that.